Anne Halley was for twenty-five years Poetry Editor of MR, had a long association with the English Department, and was author of three distinctive volumes of verse and many prize-winning stories, while enjoying a long career as a beloved teacher in the U.S. and abroad. The Anne Halley Poetry Prize is co-sponsored by the Massachusetts Review and the English Department of the University of Massachusetts/Amherst. A Prize of $500 is awarded annually for the best poem to appear in the preceding year of MR, as chosen by two editors and a member of the English Department. The prize poet is invited to give a spring reading in Amherst. 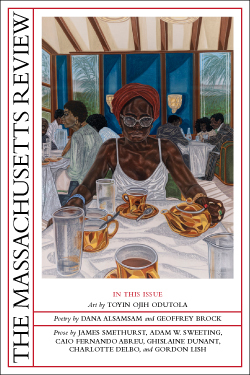 Massachusetts Review plans to dramatically increase the amount of fiction, poetry, and socially-engaged nonfiction we publish in translation. Today, we see a great need for literary journals to internationalize—to open their ears and their pages to voices from outside the United States, and to writers in languages other than English. MR believes we have a real opportunity for synergy with friends and colleagues from local institutions, given the strength of the University of Massachusetts Amherst programs in translation, of the locally-based translation studies journal Metamorphoses, as well as of the American Studies Diploma Program at Smith College (a one-year graduate program exclusively for international students). But we will of course need the help of readers, colleagues, and translators from across the globe. To that end, we announce the Jules Chametzky Translation Prize. The Jules Chametzky Translation Prize, sponsored by theMassachusetts Review, will be awarded annually to a translation published within our pages; the prize will award $500 for a work in translation, alternating between poetry and prose. Poetry translations published during a year in which the award is given to prose will be considered along with the publications of the following year, and v.v. All translations published by MR will be considered for the Chametzky prize, provided that -- as per our general guidelines for submissions -- a copy of the translated text is submitted along with the translation. Judges for the award will be MR's Translation Editors: Ellen Doré Watson(Tranlsation/Poetry) and Deb Gorlin (Poetry) for poetry, and Edwin Gentzler (Translation) and Jim Hicks (Executive Editor) for prose, along with an additional third judge, chosen yearly from the local pool of translation experts. MR editors are not eligible for the prize. In establishing the Chametzky prize, we hope to encourage the creativity of translations submitted to our journal, and to increase their number. We are particularly interested in publishing new literary voices from languages other than English. To put it simply, our goal is to publish great writing from across the globe, from writers we haven't yet heard.